Here is something a bit different today. I’m posting a midi file with the ‘Music of My Ancestors’ as part of Randy Seaver of Genea-Musings’ Saturday Night Genealogy Fun. Hope this works! And just because this is my postcard website, here is a postcard showing one of these ancestors, Walter Scott, my grandfather, as A Young Canuck. 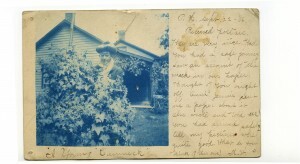 This 1906 card is one of the reasons I’m interested in fostering more use of postcards in genealogy. It’s the only evidence I’ve ever had that he visited his WOOD/WOODMAN cousins on Rhode Island in the USA. And what a sweet bit of evidence it is.